This article first appeared in The Edge Financial Daily, on May 16, 2016. KUALA LUMPUR: Malaysia’s largest gold and silver trading company, Public Gold Marketing Sdn Bhd, is set to expand its footprint into Indonesia to capture a slice of the precious metal trading market in the largest economy in Southeast Asia. Public Gold executive chairman Datuk Wira Louis Ng expects the venture to turn a profit in two years. 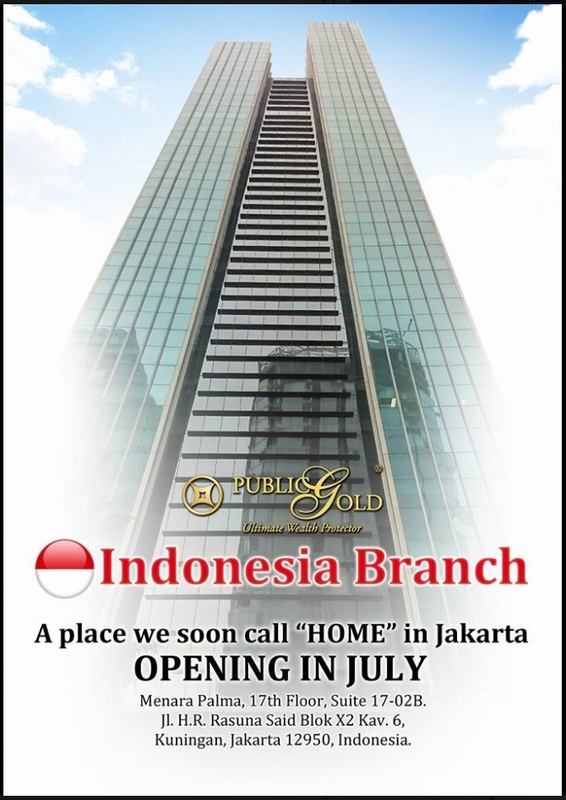 The optimism stems from the size of the Indonesian market, the group’s successful business model in Malaysia and Singapore, and growing investment interest in precious metal as an investment asset due to uncertainties in the global economy. The move follows the stabilisation of its operation in Singapore since two and a half years ago, which saw Singapore contribute 10% of its total turnover of RM300 million in 2015. “Indonesia’s population is about 10 times that of Malaysia, so we expect the turnover will also be 10 times more compared with our Malaysian operation,” Ng told The Edge Financial Daily in an interview last Wednesday. Ng said the group had begun sending staff to Indonesia to scout for a location for its head office in Jakarta since late last year. Last month, it started training local staff and appointed a local agent to be its distributor. “After a few market surveys, we feel our products are competitive in terms of pricing and product design. We hope the Indonesian market will contribute to Public Gold Group’s turnover in the next two years,” Ng said, noting that the group can begin importing products from July. An investment precious metal importer, Public Gold’s earnings mainly come from selling London Bullion Market Association-accredited gold in wafer, bar and coin forms. The bar and wafer can weigh between 1g and 250g, while the gold dinars can range from 2.125g (0.5 dinar) to 42.5g (10 dinar). It also sells silver bars weighing from 250g to 5kg. Ng said Public Gold prices its products according to the spot gold price plus 5% to 8% of margin, after factoring in the international spot gold price and the foreign-exchange rate of the ringgit against the US dollar. Ng foresees its dinar coin would be a hit in Indonesia, as the country has the largest Muslim population in the world, at 209 million. “Dinar coin is well accepted in the Muslim community. Public Gold dinar is the world’s most circulated dinar. We sold five tonnes of dinar coin in the past eight years. Dinar coin will be one of the key products for the Indonesia market,” Ng added. It targets to achieve RM1 billion sales in 2016. Ng said this should be achievable via its collaboration with Pos Malaysia Bhd’s Pos Ar-Rahnu; the latter has been selling Public Gold’s products in its 65 branches nationwide since November 2015. Ambitious as Ng may be in its sales figure for this year, the company, established in 2008, has no plan to list on Bursa Malaysia. “I don’t think so because it is difficult for the authority to understand physical gold trading. It is a new business model. Currently, we grow organically and we are okay. The pace may be a bit slow, but we are comfortable,” Ng added. In Malaysia, Ng observes that there has been a growing interest in gold and silver investments in the face of global economic uncertainties, which augur well for the company. He also said more Malaysians are buying gold because the price in ringgit has appreciated about 30% since last year, due to the depreciation of the ringgit against the US dollar. Internationally, the price rose 18% in US dollar terms in the first quarter of 2016. “Since the beginning of the year, we have witnessed turmoil in the stock market, as the currency and crude oil markets took a hit. Gold has performed since …[now it’s] waiting for the next jump,” Ng added. On April 21, BNP Paribas SA was reported as saying gold may advance to as much as US$1,400 (RM5,642) an ounce over the next 12 months, citing rising investor concerns over the efficacy of central banks’ policies to sustain growth. Spot gold was quoted at US$1,266.28 per ounce, up US$2.60 or 0.21%, as at 10.35pm last Friday. Ng said the gold price in Malaysia is determined by two factors: the rate of exchange between the ringgit and the US dollar, and the international price of gold. “Although the ringgit depreciated against the US dollar last year, [the] gold price in terms of ringgit moved up because gold is priced in US dollar. If the price of gold in US dollar remains unchanged, but our ringgit depreciates 30%, then the price of gold in terms of ringgit appreciates 30%. “Investors can make money when the international gold price goes up, or if the ringgit depreciates,” he concluded.